We send the tips and tools to create your own culinary masterpieces, because we know confidence makes a better cook. 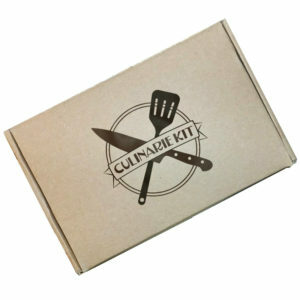 Culinarie Kit helps hone your skills and gives you the inspiration to get inventive. Use your creativity to experiment without restriction–it is the heart and soul of gourmet food! Culinarie Kit was founded by our very own Chef Ellie, with the goal of bringing her passion for cooking to the masses. Chef Ellie singlehandedly curates gourmet and artisan ingredients for each box so that you can create something new and delicious in your own kitchen. She’s also responsible for creating our line of exclusive spice blends–and one is included in each Culinarie Kit! We give you inspiration. Not instructions. Each themed box includes gourmet ingredients sourced from artisan purveyors, as well as tools or toys to expand your kitchen collection. Culinarie Kit is the ideal gift for people who love to cook, whether they’re ramen enthusiasts or self-proclaimed foodies. Our carefully arranged boxes will delight anyone’s taste buds, from the freshest cooking newbie to the most seasoned home chef. Cooking is an art; we all have our own style. What’s yours?